Yes, it was too soon. Too soon to lose someone that gave us all so many big smiles and some incredible moments. I’d already written about Robin Williams in a blog that day, which I’d been preparing to go live. I was writing about what made me become a writer, something I simply couldn’t do without mentioning his work in Dead Poets Society. I was at home when I started seeing tweets about his death. I thought it was one of those horrible hoaxes, so I asked someone to confirm it for me. Like most others I know, I was shocked and upset to learn the news was real. I remember wondering, how can I be this upset over the death of someone I have never met? But the loss felt tangible, solid. When someone connects with you – be it through their words, music or any other way – then life is that much better; you are that much more alive. As a writer, my natural inclination at times like this is to turn to words. But words don’t seem enough. Still, I felt I needed to write something. 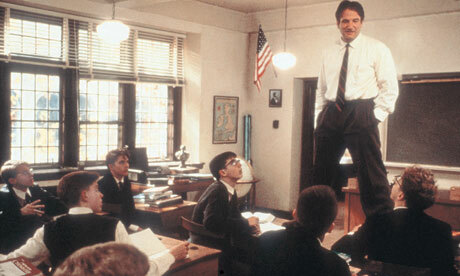 I simply wanted to say that his work in Dead Poets Society has never left me. His words inspired me all those years ago and continue to do so now. I used to daydream that one day I would meet a Neil Perry, a Todd Anderson, hell, definitely a Charlie Dalton at the very least! And most of all, I hoped that one day I’d attend John Keating’s English class. The best bit? I did. Thanks to that film, I really did. The powerful play does go on, and I will contribute my verse. I’ll leave you with what has always been my favourite quote from the film. Thank you, Robin, for everything. Well said. It really is like the loss of a dear friend.